After a week of high temperatures, I hope you find something cool to do this weekend! I'm so glad we have a working air conditioner in our classroom to keep us chilled and comfortable. Although, I know many of you are so busy that you haven't even noticed the room temperature! I'm seeing some very interesting work happening, and I'm excited to see what new creations you come up with this week! Our math lessons this week will be about finding the greatest common factor (GCF) of a set of numbers. Be careful not to get GCF mixed up with LCM that we studied last week; this is the most common mistake students make when working with the two. First, I will show you how to use our handy-dandy Montessori peg board to find the GCF of numbers. Then, we will move onto some other strategies you can use. You will have homework Monday and Tuesday evening. Your classwork will include a written journal on Google Classroom that will be due Friday. ou will have a quiz on GCF Thursday. As you work through the week, check out this sheet if you'd like some extra practice finding GCF. The answers are found at the bottom of the page. 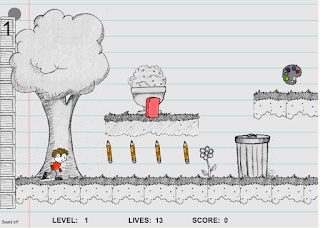 You can also visit this fun game called "Sketch'sWorld" where you must help a pencil-drawn person escape some evil erasers...while answering some GCF problems along the way! Click the picture below to play! We will continue investigating minerals this week. We will spend some time discussing mining of minerals just like the ones you've been using in class. I know you will enjoy the lab I have planned for you! Remember that you must complete three choices on your Tic Tac Toe sheet by Friday. You will also have a test on minerals Friday. You can use your notes and study guide to help you prepare. This week will also be the first administration of the MAP assessment. We will use the results of this test to show growth throughout the year. You will take this test at least one more time this year, so try your best. The score will also be used for promotion decisions. Promotion requirements for 6th grade can be found by clicking on the “Standards and Assessment” tab above.